One of the benefits of attending UCSD is that the reading series there is not the usual academic menu. 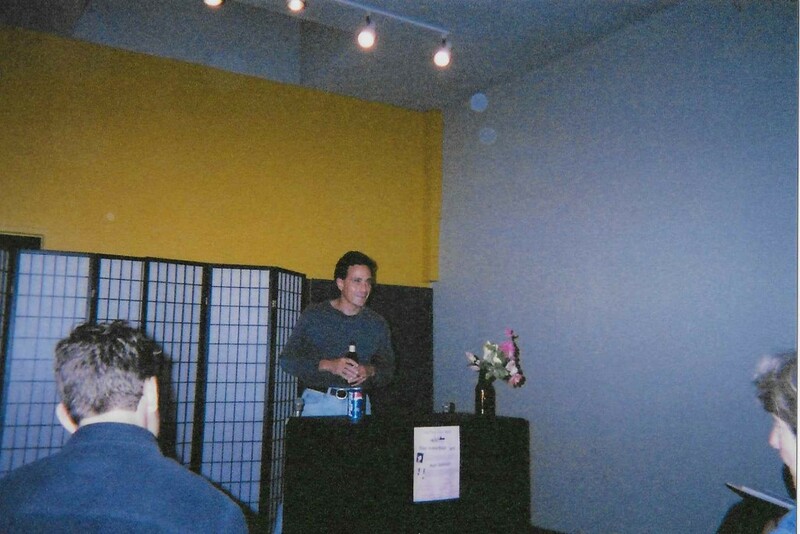 I remember in particular readings by Rae Armantrout, Ron Padgett, Dennis Cooper, Edwin Torres, Elizabeth Alexander, Mary Jo Bang, Michael Heller, Kit Robinson, and Barrett Watten. Paul Naylor. I recollect, read a series of poems he had been working on about flowers and gardens, which he had started in the summer of 2001. There were daily entries, and when he got to September 11, the poem was very brief. I remember the sense of quiet beneath some ultimate quiet slithering through the room, then twanging like that distant string in one of Chekhov’s plays. 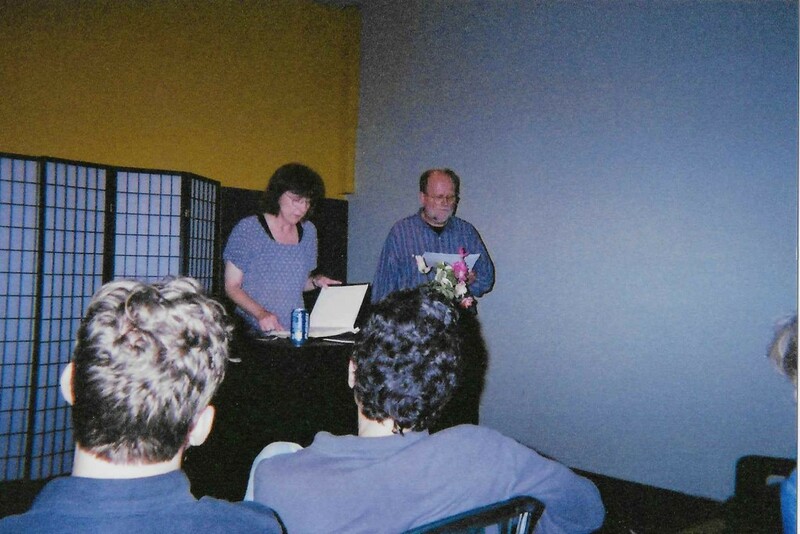 On another occasion, in San Diego, Ron Silliman and Rae Armantrout read together, though I remember the reading having Ron as the featured poet and he invited Rae to read a piece they had collaborated on. 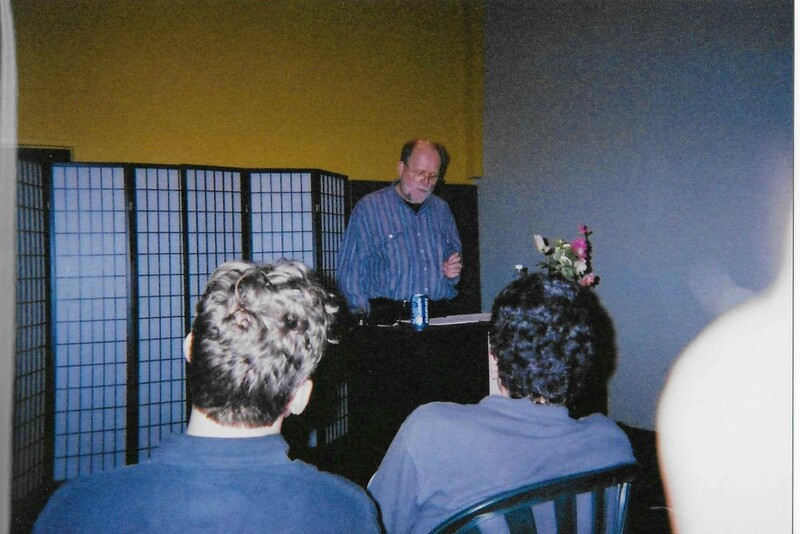 Joseph Ross gave the introduction, and then sat down in the front row next to the poet Stephen Cope, who would go on to edit a volume of George Oppen’s writings. 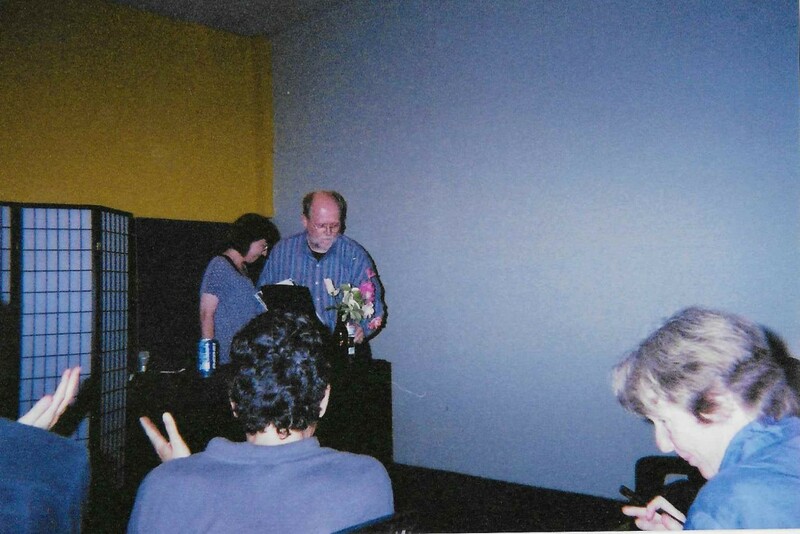 I’m not sure if Ron’s blog had even started at this point, and Rae was still working as an adjunct professor at UCSD. I would have the good fortune to be her T.A. for one quarter before I graduated in 2004. All three of our lives have changed considerably since the evening of that reading. I was inspired, in part, to run these photographs in my blog because I noticed recently that Ron and Rae are reading in New York in two months. If you’re in the vicinity, and you’re old enough to realize that many poets younger than you might need a little reminder in the midst of their whirligig lives, then do the right thing, and make certain they don’t neglect this chance to hear two of America’s finest poets. 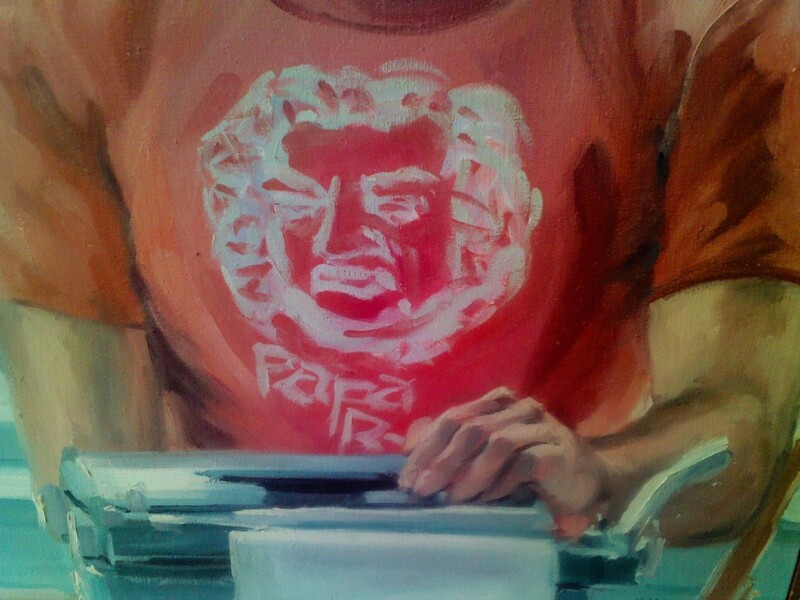 At some point between late 1971 and 1980, I bought a Papa Bach t-shirt and wore it to readings and while I was teaching in the Poets-in-the-Schools programs. In the summer of 1981, I drove up to Eureka, California with Cathay Gleeson to visit an old friend of hers, Karin. It was my first jaunt that far north in California, and details of that trip appeared in a long poem I was working on at the time, “Your Move.” It wasn’t the first long poem I had attempted. In 1973, I had worked on a long poem entitled “The Resurrection,” parts of which had been published in The Lamp in the Spine (edited by Jim Moore and Patricia Hampl) and Intermedia (edited by Harley Lond). 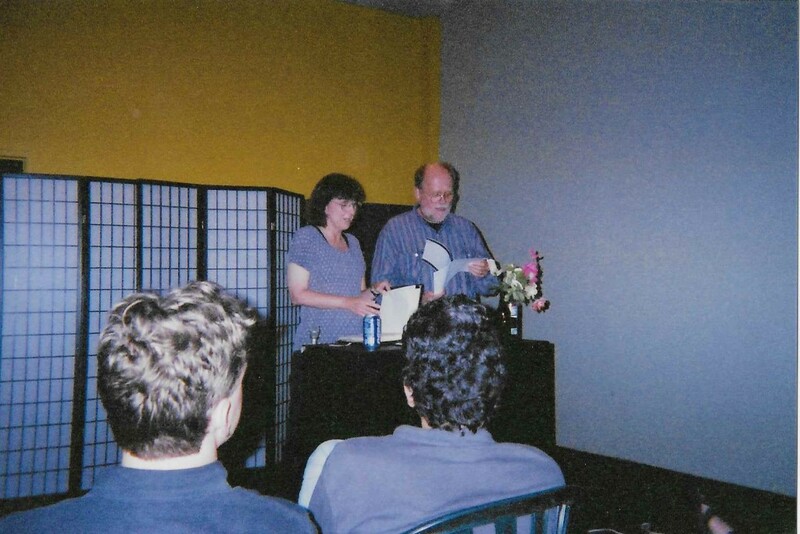 “Your Move” was influenced by my reading at the start of that decade of poets such as Kit Robinson, Ron Silliman, Lyn Hejinian, Rae Armantrout, and Barrett Watten. It quickly went beyond just reading of their work. Conversations with Ron when he came down to Los Angeles and a talk and reading at Beyond Baroque continued once we had left that venue, for he stayed over on that trip at my apartment in Ocean Park. 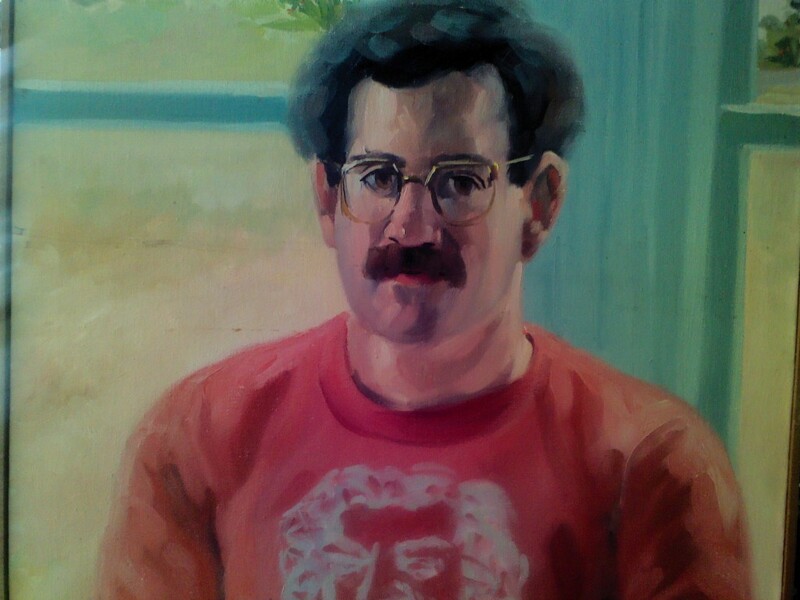 Cathay and I spent a week up in the Eureka-Arcata area, and I commissioned Karin’s friend, Jim McVicker, to paint a portrait of me, for which I chose to wear the Papa Bach t-shirt, the same one I was wearing when I was photographed teaching a poetry class in Lone Pine, California. 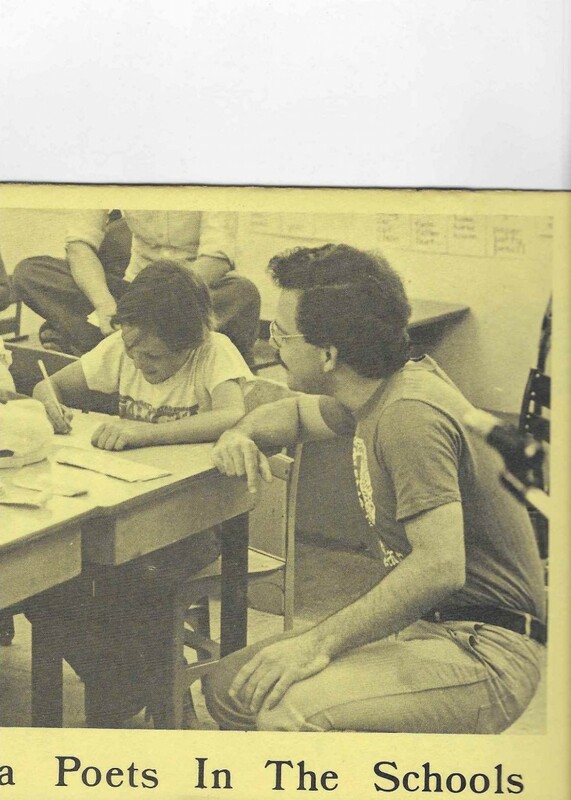 This particular classroom photograph brings back a set of contradictory memories, since working with CPITS was a problematic enterprise. The time spent in Lone Pine, however, remains one of my fondest occasions of working with other poets. Kit Robinson was there, too, and he mentions the gathering in the Grand Piano volumes as one in which he felt out of place. 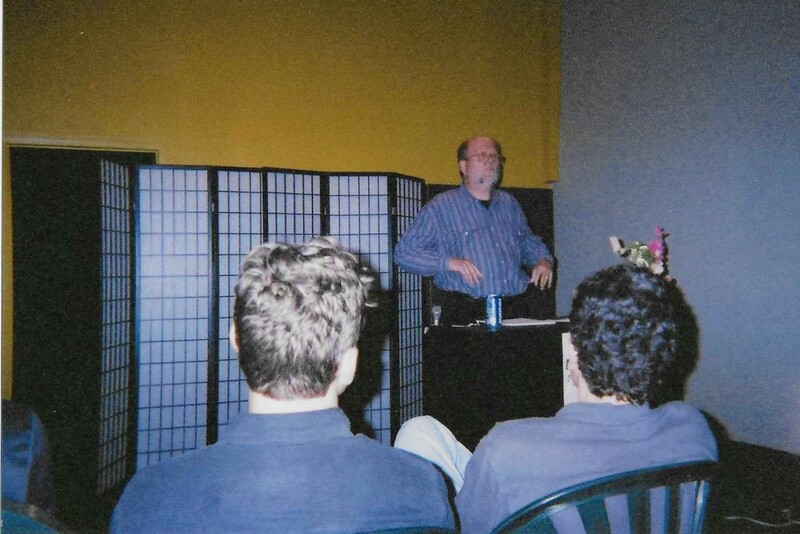 He probably didn’t realize how many of us didn’t feel quite at ease with each other, but our devotion to inspiring the students superseded the disparities in our poetics. I remain grateful to Eva Poole-Gibson for all she did to orchestrate two consecutive years in which poets from all over the state gathered in Inyo County to celebrate the joy of language surprising us when we least expect it.